Propane is clean, efficient and economical. Every year, an increasing number of Americans are making the choice to switch to propane. When home builders construct new houses, they are more likely to build them to run on propane. Manufacturers build the appliances in your home that run on propane — your stove, your water heater, your furnace, your washer and dryer and your air conditioner — to the highest standards. These appliances help your home feel warm and cozy in the winter, cool in the summer and cook your food more efficiently than any other energy source. Propane, however, must be handled with care. If you want to make sure your home is a safe home, it pays first to become an educated consumer and learn the signs of potential problems and how to deal with them. It’s also important that everyone in your home learn how to deal with these warning signs as well. How much propane will the appliance use? Do you want a less energy efficient model, so you don’t pay as much now, or do you want a more costly higher efficiency appliance and know you will save money in the long run? Learn to read and understand the EnergyGuide labels on each appliance. It will help you compare different brands and make a smarter selection. Propane is a colorless, odorless gas. It is a liquefied petroleum gas known as LNG, and normally, it is compressed, stored and delivered as a liquid. One of the main reasons that people are choosing propane over other energy options is that it is a clean energy source. It is important, however, to properly store and use propane. A gas leak can have potentially dangerous and deadly consequences. Homeowners need to learn how to detect those warning signs and practice basic safety procedures. Propane has a unique smell — similar to rotten eggs. It’s actually a chemical compound added to propane by manufacturers to alert owners to a possible gas leak. If you use propane as your home’s energy source, it’s extremely important that your entire family learn to recognize the smell. If you detect it at any time, even in the smallest amounts, it may mean you have a gas leak. Anytime air or water gets into a propane tank or if the tank is rusted, it can affect the concentration of propane odor. If your tank is underground, and a leak develops, as the gas makes its way to the surface, it may lose some of its odor concentration in the soil. Occasionally propane odor sticks to the inside of gas pipes or other material. This is why it is crucial to get you and your family to safety immediately if you detect even a faint smell of gas. One way to ensure you know if you have a leak is to install propane gas detectors. Gas detectors register the propane concentration at the actual detector, not the concentration of odorant in the air. For that reason, it is important to install more than one detector. Place the detectors near appliances that may be located in little-used areas of your home, like a laundry room or near the furnace. Be sure to use quality propane detectors as well. 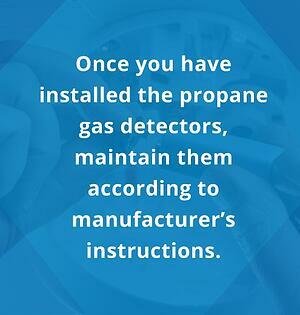 Once you have installed the propane gas detectors, maintain them according to manufacturer’s instructions. Otherwise, you’re just defeating the purpose of installing them in the first place. Extinguish all smoking materials. Also do not turn on the lights or any other appliances in your home. Do not use your cell phone or an analog phone if you have one. These sources can produce flames or sparks that can trigger a fire or worse, an explosion. Get out of the house at once. Get everyone out of your house right away and move away from the house until you feel safe. Shut off the gas. Please only do this if it is safe to do so. If you can, turn off the main valve on your propane tank. Propane tanks always close clockwise, or to the right. Alert authorities to the leak. Go to a neighbor’s home or another building that is away from the gas leak and make two calls: call 911 or the local fire department, and then call your propane retailer. Do not go back into your house until you are given the all clear. When the fire department or your propane retailer determines that it is safe for you to return to your home, then you may do so. Until that time, however, remain away from the structure. How Can I Prevent a Propane Leak? One of the best things you can do if you're wondering how to prevent a propane leak is to not run out of gas. When you fill the tank back up, it’s easy for a leak to occur. Water and air can seep into an empty propane tank, causing it to rust. Water, air and rust result in odor loss — a reduction of the concentration of the unpleasant odor that manufacturers include in propane as a warning sign. When you run out of propane, your appliances’ pilot lights go out. An extinguished pilot light can be a real problem, and we’ll talk about that a bit more below. What’s the best way to deal with this issue? Enroll in automatic delivery with your propane retailer. Make sure your tank is clean, free of rust, and other corrosion and properly maintained. Maintain your appliances that use propane and only use them for the purposes they were designed for. Get regular inspections of your system, so small problems can be fixed before they become larger issues. Properly vent and adjust all equipment. Call a plumber or a qualified technician from your propane retailer and have them check out your propane system. These technicians ensure the equipment has enough fresh air for safe combustion. Service all your appliances regularly. When you follow the manufacturer’s instructions on how to care for your appliances and heating system, you catch problems before they occur, and you also ensure these pieces of equipment last longer. Do not attempt repairs on your own. 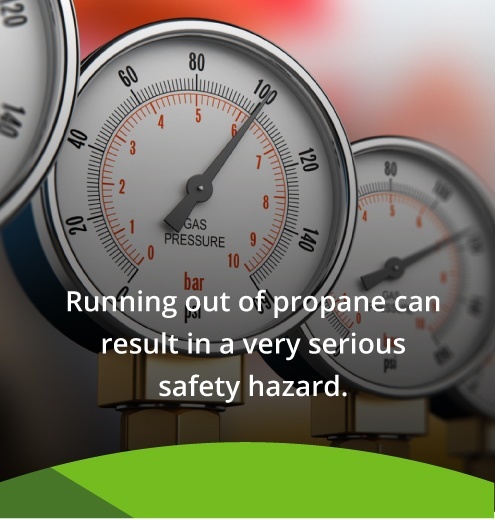 If you make a mistake with the propane system, it could result in devastating consequences. If any piece of your propane equipment needs to be repaired, get a qualified technician to make that repair. Set your water heater at the proper level. No one wants to be burned or frozen when they climb in the shower first thing in the morning. Read the instruction manual for your water heater, so you can set it to its proper and most efficient levels. Clean your gas range. A gas range that isn't clean can be a flash fire waiting to happen. Keep your gas range free of grease spatters, and clean it after every use. Don’t try to heat your home with your oven. Your natural gas range is designed for your family to cook with and enjoy great meals. It’s not designed to heat your home in the middle of a cold winter. To ensure propane appliance safety, only use your appliances for the tasks for which they were designed. Keep chimneys and flues clear. Birds, squirrels and other animals love to use chimneys and flues to build their nests. You may also have a problem with soot accumulation. Hire someone to clean your chimney or flue at least every two years, if not yearly. Watch for yellow flames. Natural gas burns blue. If you see it start to burn yellow, it may not be burning properly. This can create a carbon monoxide danger. The moment you see a yellow flame, call a qualified technician to come in and take a look. Watch the weather. If you know severe weather is on the way, you need to take some precautionary steps. Before any possible flooding, turn off the gas valve on your tank. Make sure you do this before the water arrives at your home. After the flood, don’t turn anything back on until you get the entire system checked by a qualified technician. Clear snow. This is especially important for mobile homes. Clear snow and ice from valves, piping, tubes, valves, chimneys and flues — anything to do with your propane system. Uncleared snow and ice can cause damage that often results in gas leaks. After a storm, take a good look at your equipment. Did the tank shift? Does your regulator look okay? How about your valves? Does anything look bent or damaged? If you notice something unusual, call a technician to take a look right away. Regularly test your propane tank for leaks. Put a little soapy water on the connection between the tank's cylinder valve and its regulator. Slowly open the valve and look for bubbles. If you don’t see any, your system is just fine. If you do see bubbles, close the valve and tighten all the connections. Put a little more soapy water on that connection and slowly open the valve again. This time if you see bubbles, you know you have a leak. Install an overflow protection device if necessary. We talked above about the dangers of letting your propane tank literally ran out of gas. It can be just as dangerous to overfill that tank. Gas expands in warm temperatures. If you have too much gas in your tank, the cylinder pressure increases to a dangerous level. Many tanks come equipped with overfill protection devices (OPDs) to help prevent this. If your tank does not have an OPD, talk to your propane retailer about getting one installed. Regularly check furnace filters. Your owner's manual will tell you how often these your furnace filters need to be replaced or cleaned. If you’re not sure, call your propane retailer for help. Don’t remove furnace panels without replacing them. If you remove a panel and don’t replace it, you could be creating a serious problem. Keep your furnace unit intact. If you need to reignite your pilot light on a regular basis, that’s normally a sign you have a problem. Before you try to ignite it again, call a qualified technician to come in and take a look at your system. Before I Buy a House That Includes a Propane System, Is There Anything I Should Know? What Is the Propane in the Home Currently Used For? Find out how recently the home has been converted to propane. It may be that not all of the appliances in the house are taking advantage of this new energy source. So when you make an offer on the house, you might want to take into consideration whether or not to install all new appliances that run on propane. Is the Tank Owned by the Current Occupants? Owned tanks eliminate the need for monthly payments. They are also frequently buried underground, which means you’ll have more of your backyard for leisure and recreational activities. But if the current owners are including the price of the tank in the overall sales price, this can be expensive. It's another thing to think about when negotiating. Is the Tank Rented by the Current Occupants? Rented tanks do mean a monthly fee, but it also means the responsibility for the maintenance of the tank rests with the propane retailer. That way if the unit ever needs to be replaced or fixed, you’ll never have to worry about paying for it. If the current owners are renting the tank, talk to their propane retailer about transferring the agreement to you. If you decide to buy the tank outright, make sure you get proper documentation detailing your ownership and keep it in a safe place. What Is the Size of the Tank? The bigger the tank, the less often it will need to be filled. While you’re in the process of negotiations with the current owner, make sure you get the information from them about the size of the tank, so you’ll know how often it will need to be refilled. Where Are the Tanks Located? Are they above-ground or underground? Rental tanks are normally above-ground. That’s because it’s less costly for the propane company to install them. Ask for Maintenance Records. One part of the process of making sure your propane tanks are safe is knowing how often they are serviced. If the current owner can’t provide you with maintenance records, that’s not a good sign. If you’re still interested in the home, make sure you have the propane unit inspected by a qualified technician before you sign any document. Being a good consumer is a smart idea. The more you know about the propane system in use in a home you’re about to purchase, the safer you’ll feel. That’s especially true if the current owner has observed and used many of the tips we’ve mentioned above. If you take good care of your propane system, it will take good care of you. Propane is a great choice for you and your family both in terms of efficiency and cost. It’s also a better choice for the environment than oil or coal. And if you follow our suggestions above, you can help prevent gas leaks and similar problems in your home. Remember to do an annual checkup on your system even if everything seems perfectly normal. If you educate yourself about the best ways to use propane and how to avoid any problems, you and your family will enjoy many happy years of warmth in the winter, coolness in the summer and great family meals. Whatever your propane needs might be, Smart Touch Energy’s team of qualified technicians and knowledgable support staff means your home will get the very best service. You can place your orders at your convenience online, and we offer low pricing and many value-added features. When you’re looking for a great partner in Pennsylvania, one you can rely on to make sure your home has the propane it needs, please give us a call. If you’d like to check prices and order or contact us for more info or help, call us at 855-385-7678. You can also send us an inquiry, and we’ll be in touch as soon as possible.